San Francisco is well known for their incredible food. 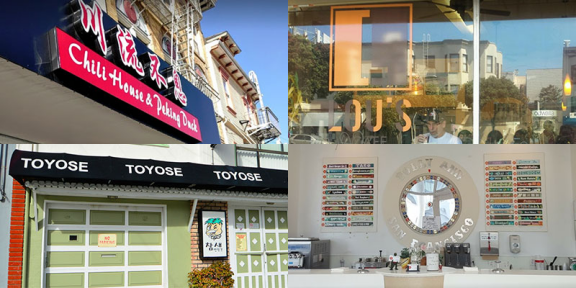 If you ask any SF foodie where their favorite spots are, I’m sure you will hear a laundry list of restaurants in and around Union Square, the Embarcadero, North Beach and the Mission. While the establishments in those neighborhoods surely play a huge role in making San Francisco’s culinary scene so vibrant, they often cause a lot of other neighborhoods to be overlooked. A perfect example of that are the Sunset and the Richmond districts on the cities western side. Today we are going to look at what kind of culinary gems “the Avenues” have to offer. When it comes to the most popular sandwiches in SF, most people will jump to say that Ike’s takes the top spot, but Lou’s Café is certainly giving them a run for their money. Opened in 2010, Lou’s became well known for the unique spreads they add to each sandwich: a tangy aioli known as “Lou’s sauce” and an olive oil-based jalapeño spread that that adds the perfect amount of heat. Lou’s is the perfect weekend lunch spot, but be prepared to wait; chances are you will be met with a line out to door! Some may be surprised that some of the best Chinese food you can get in SF can be found outside of Chinatown. If you are looking for a incredible dining experience off the beaten path, look no further than Clement St’s Chili House SF. A Richmond District staple since 2013, owner Li Jun Han has served two former Chinese Presidents. One of their most famous and popular dishes is the Peking Duck, having been known to serve up to 20 a day to their loyal customers. If you don’t look close enough, you can miss this quirky Korean spot at the end of Noriega St. The restaurant blends into the outer Sunset scenery pretty well, given that it’s located in a converted garage! Popular dishes include kimchi pancakes and potato croquettes, but it’s the crispy chicken wings that have people waiting until the wee hours of the night to get a table. Visitors better be careful, this place is well known to keep the drinks flowing for guests so it can get pretty rowdy from time to time! Ask any Sunset District native about Polly Ann Ice Cream and I’m sure you will be inundated with fond memory after fond memory of the decades-old dessert spot. Opened in 1955, Polly Ann boasts a menu of around 500 flavors in total, with about 40 or so rotated in each week. One of its more notable flavors is its popular durian ice cream, which has to be stored in a separate freezer as to not overpower the other flavors with its potent aroma. If you are having trouble choosing the right flavor for you, feel free to spin the flavor roulette wheel to help decide for you. Hello ladies and gents! My name is Keith Alderson and I am a soup connoisseur, slurping my way around the world one soup at a time, having fun and learning about our planet as I go. I learn about all of the beautiful places via their food and wonderful people, thanks for stopping by my travel blog!